The following is wikiHow’s definition of subtle beauty. This is how I would describe the presence of Epimediums in a shade garden. They are not going to scream out to you from across the lawn ‘come look at me’. But when you come across them mixed into a shade garden they are going to make a memorable impression on you with their subtle beauty. I feel that companion plants improve any hosta garden by accenting the shapes and colors of hosta. Epimedium plants are an easy to grow deer resistant companion plant that prefers moist but well drained soil and once established is somewhat drought tolerant. The more vigorous cultivars may be used under the spread of maple trees. During the growing season they exhibit a beautiful canopy of foliage in addition to a prolonged period of spring flowering. Leaves emerge green in the spring but many have a beautiful bronzy coloration. Once well established they form a weed inhibiting ground cover with their dense canopy. They are a rhizomatous plant that spreads and fills in with time. They are not an overly aggressive perennial that becomes a nuisance. If you are trying Epimediums for the first time I would highly suggest one of the vigorous cultivars. Epimedium x versicolor ‘Sulphurium’ is a vigorous yellow blooming cultivar with dark green foliage that emerges initially with chocolate colored foliage. 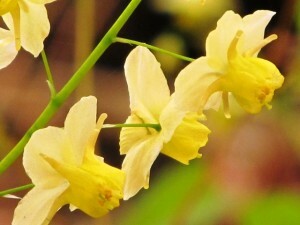 The grandiflorums are also easy to cultivate. 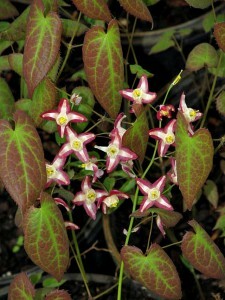 Epimedium grandiforum ‘Dark Beauty’ exhibits large purple and white flowers in April and May. 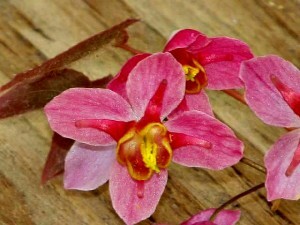 Epimedium grandiforum ‘Rose Queen’ offers bright pink flowers in late spring. For those of you looking to take a walk on the wild side, why not try Epimedium x versicolor ‘Cherry Tart’? It is slower growing but the striking pink and cherry red flowers may be just the thing to spice up your garden. Deer resistant, winter hardy, easy to grow, ground cover flowering perennials. What’s not to love?